Invest in a timepiece that is as stylish and sleek as you are. This signature mesh-style watch from Skagens Klassik collection features a stunning gold-tone case with a stark white, minimalist dial. A silver-tone mesh strap gives this watch a classic look that will complete any outfit. My wrist is very small, and the band is almost doubled and still slides up and down. I bought this watch for the looks(steel + gold) and for it's large face. Wish it could fit my wrist better! Ordered this watch for work. It’s light weight and thin which was what I was looking for. 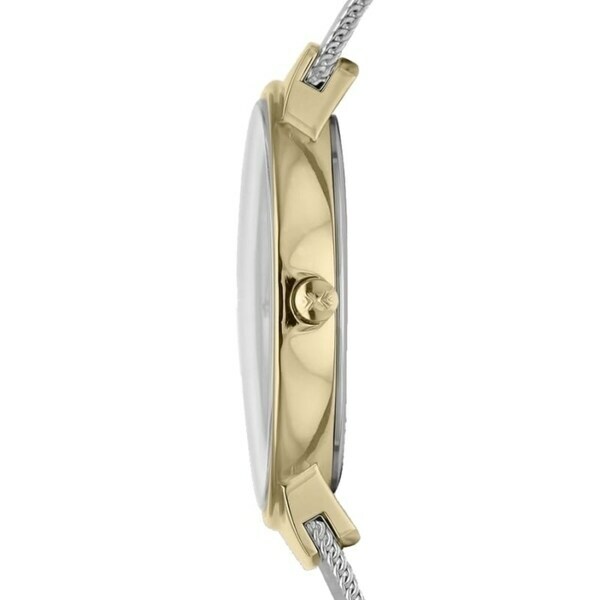 I love the simplicity of style and the fact that it’s two tone means I can wear with all of my jewelry. Good size, beautiful, gold isn't tacky, fine mesh strap. I love this watch! Very elegant & light! Lovely to look at, great style but didn't last long. Even with battery change it still is dead. Darn. have purchased 3 other skagen watches. like the sleekness. I have owned a Sagen watch for years and love it. Just wanted another one with both gold and silver on same watch.